Viewpoint Tickets - Best prices on Indians tickets, MLB tickets and MLB All Star tickets. Location: On the shore of Lake Erie between the lake and downtown Cleveland. 1st base (S) W. 3rd and Cleveland Memorial Shoreway; 3rd base (W) Erieside Ave., Lake Erie and W. 3rd; left field (N)Erieside Ave. and Lake Erie; right field (E) Cleveland Memorial Shoreway. Dimensions: Foul lines: 322 (1932), 320 (1933), 319 (April 27, 1947), 320 (June 6, 1947), 321 (1948), 320 (1953); corners where fence meets stadium walls: 362 (June 6, 1947), 360 (1980), 370 (1991); power alleys: 435 (1932), 365 (1947), 362 (1948), 385 (1949), 380 (1954), 400 (1965), 390 (1967), 395 (1968), 385 (1970), 395 (1991); short left-center: 377 (1980), 390 (1991), 364 (1992); deep left-center: 387 (1980), 400 (1991), 375 (1992); grandstand corners: 435 (1932); bleacher corners: 463 (1932); corners where inner 8-foot fence meets tall 16-foot straightaway center fence: 417 (1991); center field: 470 (1932), 467 (1938), 450 (1939), 468 (April 1947), 410 (April 27, 1947), 408 (1966), 407 (1967), 410 (1968), 400 (1970), 415 (1991), 404 (1992); deep right-center: 395 (1980), 400 (1991), 370 (1992); short right-center: 385 (1980), 390 (1991), 360 (1992); backstop: 60 (1991); foul territory: very large. Fences: Left and right field: 5.25 (concrete, 1932), 5.5 (wire, April 27, 1947), 5.25 (concrete, June 6, 1947), 6 (concrete, 1955), 9 (wire, 1976), 7 (wire, 1977), 8 (canvas padding, 1984); center field: 12 (concrete, 1932), 5.5 (wire, April 27, 1947), 8 (wire, 1975), 9 (wire, 1976), 8 (wire, 1977), 8 (canvas padding, 1984), 16 (for a 36-foot-wide are in dead center, angling down to the lower fences in the alleys, canvas padding, 1991), 8 (canvas padding, all the way around the outfield, 1992). Proposed as a symbol of great civic pride, Cleveland's voters approved of building Cleveland Municipal Stadium by a margin of 2-1 in November 1928. However, a series of lawsuits and newspaper articles soon revealed issues which soured the public view of the stadium. By the time the stadium formally opened on July 1, 1931, it was generally regarded as a mistake. The Indians played in Cleveland Municipal Stadium from July 31, 1932 to September 24, 1933. After that, the Indians usually played only their Sunday and holiday games there until Bill Veeck finally moved all of the team's games to the massive facility in 1947. On September 12, 1954 against the Yankees, the Indians played in front of their largest crowd in history, 86,563. It was the largest crowd for any team until the Dodgers started playing in the Los Angeles Coliseum. For most of their years at Cleveland Municipal Stadium, however, the Indians fielded losing teams and attracted small crowds which contrasted with their enormous ballpark. The stadium was demolished in November 1996. A.K.A. Cleveland Stadium, Municipal Stadium, Cleveland Public Municipal Stadium, Lakefront Stadium and "The Mistake by the Lake." The original budget for building the stadium was $2.5 million, which was exceeded by approximately $500,000. It has been said my many, including this site, that the stadium was built to attract the 1932 Olympics. Research has revealed that this was probably a myth. Teepees were erected in 1946 in the center field bleachers. Site of the 1981, 1963, 1954 and 1935 All-Star games. Joe DiMaggio's 56-game hitting streak came to end here on Thursday, July 17, 1941. On September 23, 1949, Bill Veeck and the Indians buried their 1948 pennant in center field before a game, the day after they were mathematically eliminated from the pennant race. The center field bleachers were called the "Dog Pound" during Browns football games. On Beer Night, the Indians forfeited their June 4, 1974 game when unruly fans took over the field and would not leave. The Indians enlarged the field of play significantly in 1991, believing that this would help their defensively oriented team, but the strategy didn't work and the fences were moved back in 1992. No player ever hit a ball into the center field bleachers. From The Crowning Jewel to the Mistake on the Lake: The Story of the Construction of Cleveland Municipal Stadium by Dryck Bennett. Cleveland Stadium: The Last Chapter by Jim Toman, Gregory G. Deegan and James A. Toman. 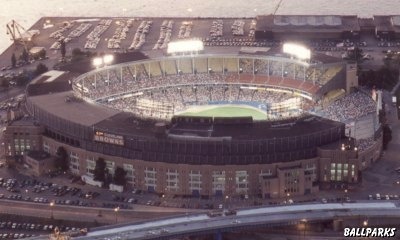 Aerial view of Cleveland Stadium © 1993 by Louie Anderson. Cleveland Stadium Finale © 1996 by Thomas Kolendra. Exterior view of Cleveland Stadium courtesy of George Tinker. Field level view of Cleveland Stadium by Munsey & Suppes. Cleveland Stadium under construction © 1996 by Osborn Engineering. Tickets to Cleveland Indians, NCAA Basketball Tournament, College Football Bowl, NCAA Football and Paul McCartney provided by Ticket Triangle.